It's no secret that I hail from New Jersey, but it's also pretty clear I have a love of all things New York Sports. Well, I am Brooklyn-born, after all. So it should come as no shock that come Superbowl Sunday, I had to show my love for the Giants. And so I chose the newest polish in my stash... Nubar Night Sparkle! Holy Victor Cruz Salsa! 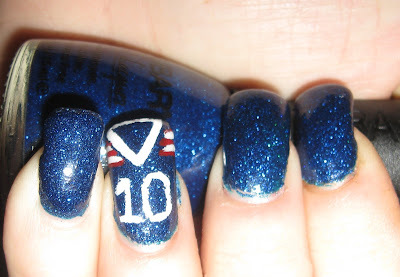 This one is a stunner and the Eli Manning jersey nail art only makes it better. A gorgeous midnight blue with royal sparkle, Night Sparkle is my first Nubar. But certainly won't be the last. The only downside to this polish is that you're looking at three coats of Seche Vite to smooth out this monster top coat eater. But it's so worth it. And hey, maybe it'll last me until next year's Superbowl. So what do you think ladies? Are you Team Manning or Team Brady? Or are you more interested in the commercials? I love your NY Giants look!! I am a HUGE NY fan (grew up in Paterson, where Victor is from); haven't lived in NJ in years but still home to me!! I'm going to try to save your picture and copy your art for next year if that's ok! !